New Hawaii Routes Are Cause for Celebration! It’s easer than ever to fly to Hawaii, especially if you’re a west-coaster! That’s because Virgin America just started new daily non-stop flights from San Francisco to Honolulu. And, starting Dec. 3rd, the airline will begin daily non-stop flights from San Francisco to Kahului. It all started in San Francisco, when airline executives surprised selected a group of “workoholics” in San Francisco by offering them seats on the inaugural flight. After flying in a plane decked-out like a colorful tropical oasis, the lucky passengers received a red carpet reception on the Honolulu tarmac, with a traditional Hawaiian welcome and blessing with Hawaii Governor David Ige. Once inside the Honolulu Airport, passengers were greeted with a luau, Hawaiian hula, Polynesian drummers, even mai tais. 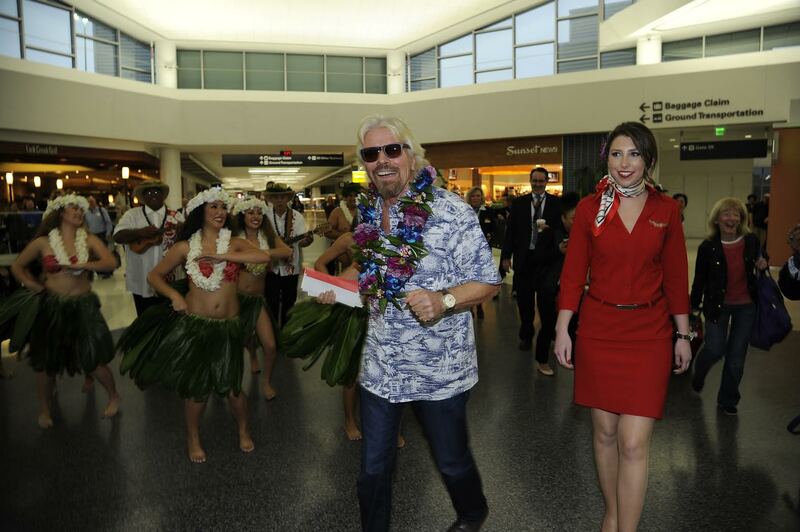 Sir Richard Branson and the passengers aboard the inaugural flight to Honolulu were greeted with hula and mai tais at the Honolulu International Airport. Sir Richard Branson, the British billionaire who helped launch the airline tagged along for the ride, too. That night, he and Airnb’s Jonathan Mildenhall joined the passengers for an oceanfront sunset event at the phenomenal Paul Mitchell Estate. As you may have guessed, oh-so-quirky Virgin America is making its Hawaii-bound flights one-of-a-kind. The fleet of planes features are mood-lit with touch-screen personal entertainment and an on-demand food and cocktail menu on every flight, so travelers can kick-off their Hawaii holiday as soon as they step onboard. If you’re fortunate enough to fly First-Class, you’ll sit in plush, white leather seats, complete with lumbar massagers. And, the food? First Class guests can choose from island-sourced fresh dishes including a grilled pineapple appetizer, Crispy Thai Chicken with a macadamia nut crust and Lilikoi Ice Cream. And, each flight features Island libations, including a POG Mimosa in First Class and a Makena rum cocktail. Flight attendants and airport personnel "broke-in" the new gate at the Honolulu International Airport. The airline and Airbnb have committed to using their new Hawaii platform to help others, too. Virgin America and Airbnb announced that the companies will pledge $100,000 (in cash, flights and Airbnb accommodation credits) to Make-A-Wish Hawaii. 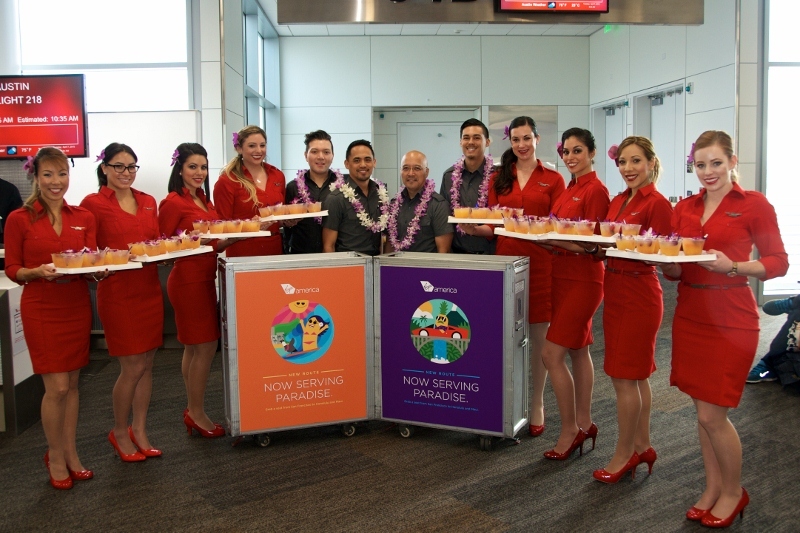 And, as part of its efforts to plant new roots in the Hawaii community, Virgin America announced partnership with Panana Leo, a nonprofit that provides for and nurtures various Hawaiian language environments. The airline is providing $25,000 to support the organization’s education programs. Virgin America is also marking the launch of these new flights by offering San Francisco-Honolulu and San Francisco-Maui fares from $199 (taxes and fees included, restrictions apply) or 8558 Elevate frequent flyer points (plus fees). The additional routes also expand the options for visitors who book a Hawaii Vacation Package through Hawaii Aloha Travel. Hawaii Aloha Travel is committed to finding the cheapest, lowest fares for you from all major U.S. cities to any Hawaiian island. So, if you’ve been waiting to book your Hawaii vacation, now may be the time to get on it! After all, more flights means more options. And more options usually mean better deals!